Silkscreen printing is one of the oldest fabric printing techniques. You will probably have an idea of what it entails from art lessons in school. It involves the use of materials that are easily available, and you can find instructions online on how to make some of this equipment at home. It is easily improvised. The process involves the use of a mesh to transfer ink in a controlled environment through a stencil that blocks out specified areas to create a design. For a good result, it is prudent you use standard tools especially if you are looking for that professional result which can easily be achieved by following a step by step guide. This is the component on which the screen with your design is going to be mounted on. Wooden frames are quite common but do not have a long lifespan because of their constant contact with liquid ink that is used to make the print. An aluminum frame is the most ideal. It is light, easily cleaned and lasts for as long as there is no physical damage caused to it. This can be bought at a local store and is now made using a variety of materials that are easier to use and long lasting. Polyester is a common material used to make the mesh. You can, however, improvise by stretching your own mesh over the frame and use tacking pins to firmly fasten it to your frame. This is where you will apply and squeeze ink to make your design. Some frames come complete with a screen. This is where you will cut or design your image and is the ink-blocking tool of the process. This is what will filter color from restricted areas and allow it only to the exposed parts, and that is what creates the pattern or design on your fabric. This is the appliance used to squeeze the ink past the screen and onto the fabric to be printed. It is made of rubber and a handle of wooden, plastic aluminum or synthetic materials. Avoid the wooden handle if possible because of its relative lifespan. There is a variety in terms of quality and nature. Do not experiment with normal ink. It does not work for screen printing and will only end up messing your t-shirt. You will have to choose between the traditional plastisol screen printing ink and water-based ink. Plastisol has got a great print and is clearly visible above the fabric. You can also obviously feel the print if you run your hand over it. Water-based inks have a different property; they soak into the fabric and are not felt by the hand if you run it over your print. This is essential in ensuring there is no spillage on the sides of the frame when you press the ink through the screen. A considerable amount of pressure is used in this action. Come up with a simple design for starters with a single color in mind. Multiple colors require multiple screens and will complicate the design process for you. Start with a single color. The design could be your name, City you come from or something else you identify with. Next, you need to cut out the design using an extremely sharp steel cutting tool. It has to be sharp because of the accuracy required for a clear print with no smudge like features at the outlines. The cut should be made in one motion, and that is why the tool needs to be extra sharp. Slicing up and down will give the same faulty image. Line your t-shirt with a hard material on the inside such as the cardboard. This will make the printing motion easier and it will prevent ink from seeping to the back side of the t-shirt. Lay down your fabric on a hard surface such as a table and make sure it is well aligned. It is an extra precaution to iron the t-shirt beforehand just to make sure the print lies in the exact intended position. Lay the screen over the t-shirt and make sure the cutout design is at the exact point you want to make the print. You make the print by pouring about 10ml of ink at the top of the frame and using the squeegee. Gently but firmly press the ink through the stencil in single motions from the top to the bottom. After you are sure that the ink has spread across the screen and through to the garment lift off the frame. There, you have your design. Do this using a pressurized source of water such as a tap, hosepipe or shower. You can repeat the process to familiarize yourself more after which you can now experiment with a second color. This will involve the use of more than one stencil for each of the two colors. This kind of screen printing is called the ‘flatbed technique’ and is the oldest and most common of all screen-printing techniques. Though this method is considered very basic and may not be used to make complex designs, it is very effective in giving quality outcomes of simple but good designs. It also has a characteristic look that is easily told apart from another screen printing. Why would you go for this method over the others? Simple tools for a simple technique. Most of the materials are available locally. The same can be easily improvised using materials within the house. A screen, for example, can be made using an old curtain and will be just as effective as screen purchased at the local store or online. All the other tools can also be improvised. The tools used are also not susceptible to damage easily apart from the hard impact which would mostly be caused by carelessness. The concept is easy to understand and is very useful as a foundation to learn other screen-printing techniques whose principles spring from this one. The designs being simple in nature trigger you to be more creative personally as opposed to say using graphics on a computer to generate various designs. You need to be more creative to come up with a good design. Again, it would be a good stepping stone to more advanced techniques. After using traditional screens to make various designs, it would be a walkover using more advanced or digital methods. Once the equipment is set up, it hardly takes time to make one print. It is even easier once you get used to the process and you will be able to work at faster speeds without making mistakes. If you are selling the products, the profit margins will be higher because the process is manual and does not use power and this is especially realized if you get bulk orders. It is easy to teach an assistant on the job, and the person can easily take part in the various processes without too much instruction. 1. What do screen printers do? This printing technique uses a mesh to transfer ink onto a material. Then a squeegee moves across the screen and fills the open mesh with ink. And, a reverse stroke makes a momentarily contact along the line. The ink makes the substrate wet and the blade springs back. You can only apply one color at a time. To produce a multi-colored image, several screens are necessary. 2. How much will it cost to buy T-shirts and print them at home? 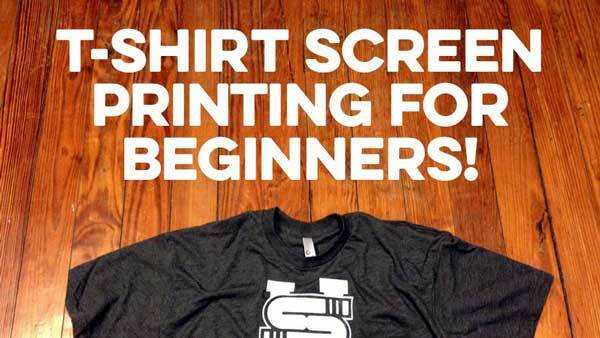 You can approximately print 72 shirts in less than 25 minutes. And, you can charge at least 8 bucks for each shirt or $576 for 72 shirts. If you buy in dozens, it will cost $2 per T.
Total cost of printing material would be $169. If I break it down, it will be $21 for screen making material, per screen costs around $3.50, ink cost per shirt, lights and electricity bill. 3. What are the benefits of owning a home-run screen printing business? Who doesn’t love T-shirts? And, there is a huge industry around this T business. The big players don’t want to take a small amount of order, and the market for small order is a huge and strong one. There are many perks of owning an at-home screen printing business. You have the luxury to start your business at home, don’t need a lot of space and can make hundreds of dollars per hour. You don’t have to worry about any technical process, just print what the customer ordered. Easy to find blank shirts for local dealers. You can also create your own brand and be your own boss. Remember to use the best quality of materials that you can afford and try to progressively move towards using more standard equipment and materials for the best result. Traditional screen printing has been used by many successful fashion designers as a starting point. It has proven the test of time and is still one of the most favorite techniques for making prints on various clothing items. So, get up, get your tools and start your screen-printing practice.